Recently, I’ve learned first hand why some people don’t buy fabric until they are ready to sew it up immediately. Over the last two or three years, I’ve purchased some fabulous home decor fabric. Yards and yards of it on huge bolts with plans to sew it up for bedroom, living room, and craft room drapes. It never happened. The fabric was purchased before I put my new floors in, and before I got to the point that I couldn’t really sew for a while. Now my tastes have changed, as has my interior decor, and the fabric doesn’t work – or if it does work, not in the place I originally planned. I also purchased a beautiful blue/gold heavier woven type fabric for drapes, and they may still work in my family room with my new blue color. The problem is the weight of the fabric is heavy and might be too visually heavy for the lighter, coastal feel I’m going for. Alternatively, it might work in my bedroom. I’m not sure. Next, I had purchased this beautiful chocolate brown, pink, and celadon green paisley that I planned to put in my sewing loft. My sewing loft is at the top of the stairs, is open and bright and this fabric would still work, if I still wanted the green in that room, which I no longer want there. I’ve decided that I love the blue and beige colors I’ve landed on in my downstairs, and the beige (actually called Pony Tail) will be carried through the main open areas in the home. In the loft area for the sewing room, I’m going to do two accent walls of the same blue as the kitchen, tying it all together. I love the blue. It’s calming and contemporary. So, the fabric I chose for my sewing room will probably move to my office area, where I will have the green. 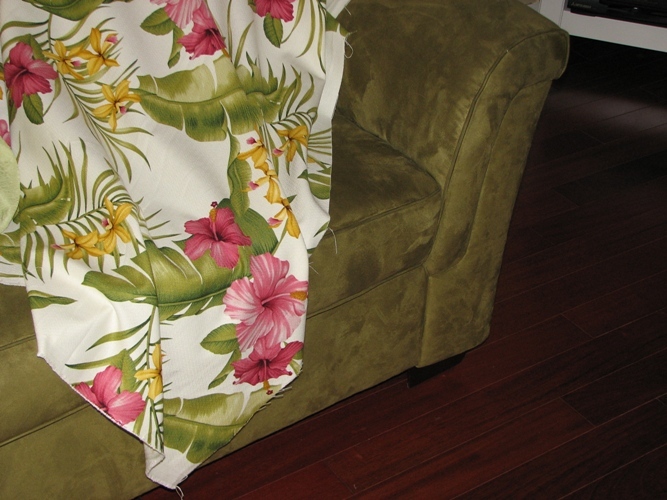 The beautiful fabric I bought in Hawaii last year to go with my green couches will now go in my front entry room. I still love this fabric. It sings to me and goes well with the coastal, warm, tropical feel I’m aiming for. Now all of this moving around and changing ideas is fine right now because I haven’t cut the fabrics, and I can measure and sell the fabrics I no longer want, although I’ll never get what I paid for it. And if I had sewn it all up, likely the lengths would be all wrong. I sure hope that once I get this settled and done, I can move on and have no more decorating ADD and fickleness. Then it will be time to go through my clothing fabric stash and inventory it with the same scrutiny. I guess that’s just all part of life and changing, isn’t it? Don’t feel bad…I, too, have yards and yards of home dec fabric I purchased 4 years ago to do the window treatments throughout my house…not one of them did I ever do…LOL! Oh, yes, that fabric you bought in Hawaii is still yummy. I know what you mean about changing your mind…..anybody want about 20 yards of celery green upholstery fabric? Bah. The couch I was going to recover got taken to the dump not too long ago and I’m not sad about that one bit! 🙂 I also have several yards of dark green sheer fabric on hand because I decided against making them for whatever reason. We were on a green kick – can’t you tell – and now I’m bored with it and ready to move on. Your home will all come together eventually! And I’m kinda bummed about you being done with roses….I hope you still frame that picture you posted several months ago, tho! @Bev – Oh, I’m still a rose lover and I’ll definitely frame those pictures of roses. They’ll look great in frames, just not the purple swirly rose fabric. I found a picture of it online. I’ll update the post to show it. I LOVE that Paisley print fabric! How much do you have of it? I wonder if I could use it in my house…It’s gorgeous! April: I probably have over six yards of it, I’m sure. I need to measure it. I bought it at Joann’s about a year or so ago. It’s great. I was thinking I’d put it in my office but I want my office more sage than pink, although it might look nice. If I decide not to use it, or have any leftovers, you’re welcome to it. I sooooooo want to sew again. I need to just get to it. Seems like there’s always more to do first, you know? I bet you’d like the sheer fabric too. That room is so beautiful, but the floors alone make me want to sit in there and read. Gorgeous. Wendy’s back! Yay! Hi Wendy. I love my floors. I have those in every room of the house except the kitchen and bathrooms and laundry room. I love, love, LOVE them. 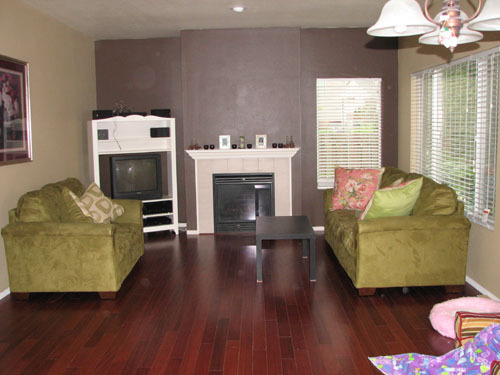 They are prefinished 3/4″ brazillian cherry hardwood and so extremely durable. All the dogs running all over and cats chasing them haven’t hurt them a bit. Even little accidents clean right up without leaving a trace. Couldn’t say that for carpets. Ewww. I just realized your lovely moss green sofa looks like suede, is that suede? I love it. Wendy, it’s microfiber. Very durable. Has to be since I can’t keep the doggies off of it with their bones. EWWW. I don’t do fabric. I have no curtains in any of my windows. No shades or anything to block the natural light from outdoors. I have 8 skylights. Everybody can see into the house but not many people drive by unless they are being pursued by the police. The only people that can really see into the house are the new people across the street. They can really only see into the living room so all they get to see is me on my computer. You’ve all seen my room. I decorate with objects, tons and tons of objects. My daughter said she’s going to decorate my living someday but it’s been a year and it hasn’t happened yet. She’s the one with simple tastes and would use fabric. I just like stuff. Do you have the fabiric that matches the bedroom set if so how much do you have? Sorry, Justine, I did, but sold the fabric some time ago. Dang it! Iam searching for some of that same fabric my local fabric store is out.Thank you. Very classy looking ! Great idea, love it !